Wat Si Saket was one of the very few temples to have survived the massive destruction caused by the Siamese invasion in 1828 which ravaged numerous other wats in the capital city. Instead, the intruders actually harnessed this temple as their headquarters during the conflict to administer the region, thereby explaining the minimal damage dealt to it as compared to its counterparts which were not that fortunate. 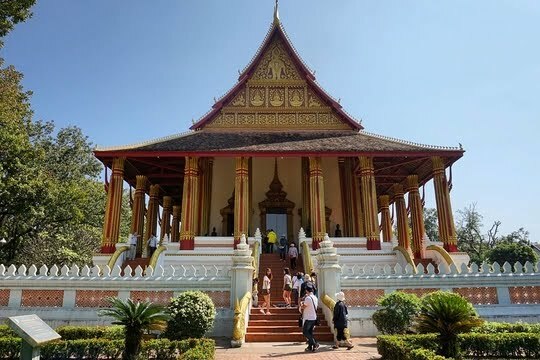 This not only makes the temple the oldest in Vientiane but also the oldest Buddhist monastery in the entire country of Laos. Enjoy the peaceful, tranquil atmosphere which seems to be emanate from the wat! Many believe that Wat Si Saket was spared from destruction by the aggressors from the south due to the fact that it was constructed in early Bangkok-styled architectural design instead of being built in the traditional Lao Buddhist style. The simple design of the cloister starkly contrasts against the architecture of many other temples we've seen here in Vientiane. Nevertheless, numerous travellers oftentimes flock to this temple not only to admire its magnificent architecture but also to admire more than 10,000 Buddha images housed in Wat Si Saket. 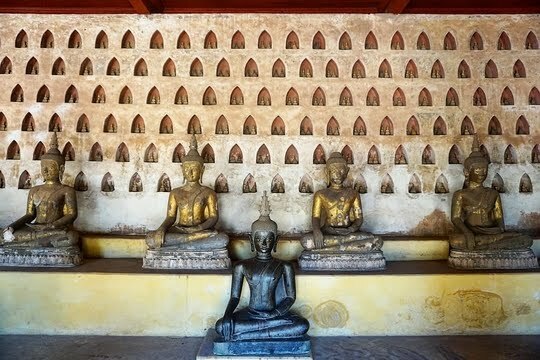 Upon arriving in the wat, visitors will immediately be attracted to the walls of the cloister which are home to almost 7,000 miniature Buddha images in uncountable niches, oftentimes in pairs. My favourite statues are always the ones donning the bright saffron robes! Seated peacefully in front of the walls are the larger Buddha statues carved from various materials such as wood, stone and bronze. Some of these statues date back as early as the 16th century, thereby reflecting the deeply-rooted influence Buddhism has had in this country since the olden days. 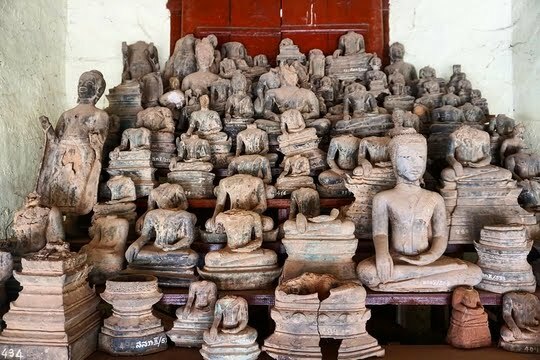 Walking along the sheltered cloister, visitors will stumble upon hundreds of damaged Buddha statues that were uncovered during excavation works in the area as well. One can only wonder how old these statues which were excavated are! The majestic prayer hall in the temple houses a massive Buddha statue seated high above on a pedestal. Entering the prayer hall allows visitors to admire the gigantic Buddha statue. Visitors will be surrounded by walls emblazoned with gorgeous murals reflecting religious symbols and hundreds of niches containing even more Buddha statues. Check out this aged wooden drum with religious inscriptions and scripture! Please note that photography in the hall is prohibited like in many other temples in the area in order to preserve these ancient relics. Religious relics (like this miniature altar carved in gold) can be found outside the prayer hall. As such, visitors can just indulge in the peaceful ambience of the temple and observe various Buddhist practices and traditions as locals do their prayers before the deities. 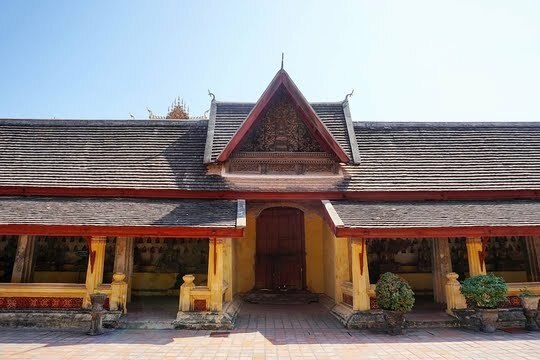 Having visited the wat, visitors can relax in the courtyard which is adorned with myriad stupas and a drum tower as well as plenty of greenery offering shade from the scorching sun. 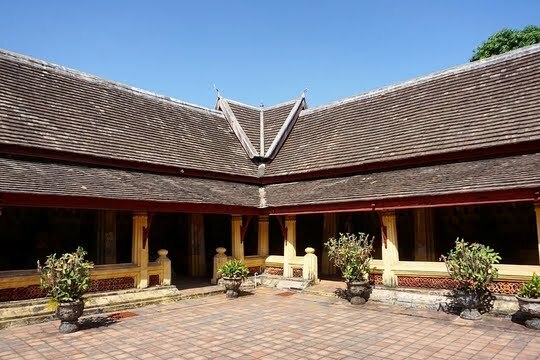 Alternatively, they can choose to walk along the area behind the temple where they can view the monks’ living quarters before concluding their visit here. Travellers can admire the magnificent architecture of the monk's living quarters in Wat Si Saket too. 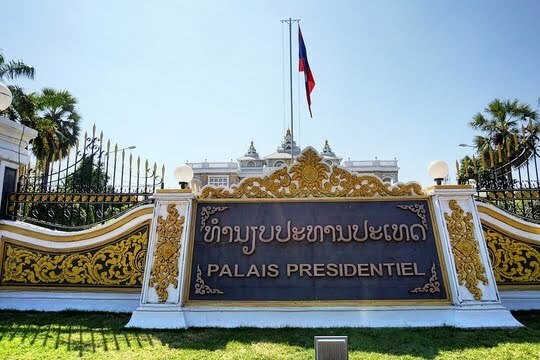 The construction of the Presidential Palace was originally commissioned by the Royal Lao government on the area which previously housed the royal residence. 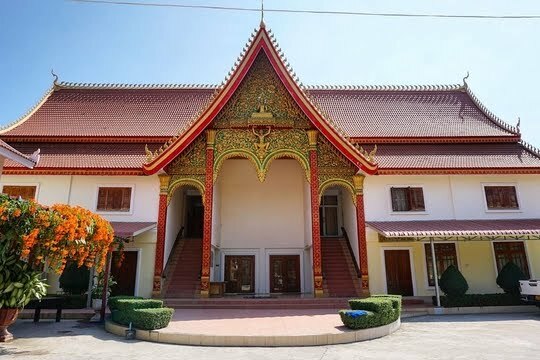 However, due to the fact that the communist Pathet Lao overthrew the royalist government and forced the emperor to abdicate in 1975, the palace was only completed much later than expected in the 1980s. The Presidential Palace immediately stands out with its unique architecture unlike any other. 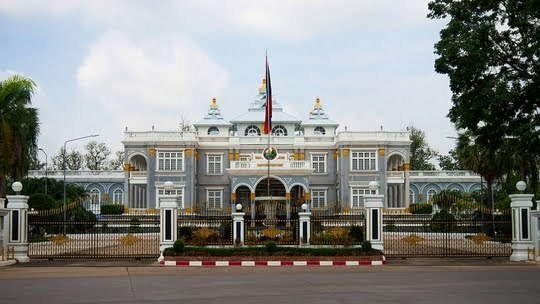 The official residence of the President of Laos, the Presidential Palace is known for its French-inspired architectural design modelled after the Beaux art style. Laos is certainly at the cultural crossroads of East and West! Possibly the most Western-looking building in the entire of Laos, the building not only has well-kept gardens but also boasts imposing colonnades and shaded balconies. If not for the stupa structures erected on the roof of the building, travellers may even think that they have been whisked to the West for a moment. This could definitely pass off as a palace in Europe! Unfortunately, the building is off limits to the public since it opened its doors more than 30 years ago and remains as an exclusive venue for government events, functions and ceremonies. 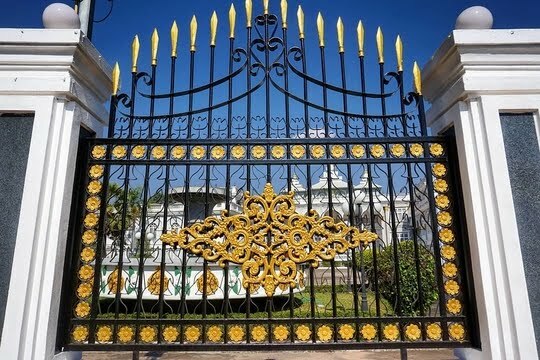 Peeking through these massive gates with beautiful designs carved in gold! Nevertheless, as the building is just a stone’s throw away from Wat Si Saket, it is very convenient for visitors to simply stroll along the boulevard and stop by to peer through the iron fences to admire the magnificent architecture and grab a couple of shots before heading off to their next destination. Not only does the architecture seem inspired by the French, its name is also written in Français! 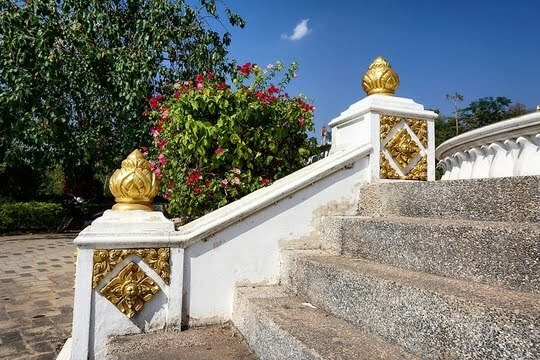 In commemoration of Vientiane’s 450th anniversary, this park was constructed in 2010 to recognise the massive contributions made to the country by King Chao Anouvong who was the last emperor of the Kingdom of Vientiane before being annexed by Siam. 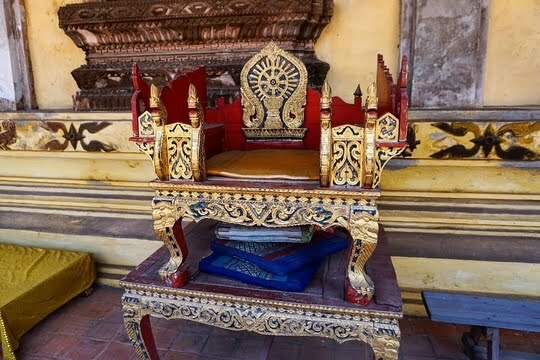 The king is widely revered by the locals for his valiant, persistent efforts in rebelling against Siam in a bid to free Vientiane from being a vassal state and to recreate the former empire of Lan Xang, albeit unsuccessfully. 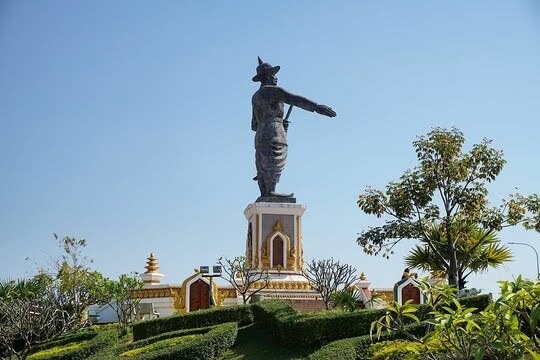 The most prominent feature of the Chao Anouvong Park is undoubtedly the majestic bronze statue of the king which towers above the entire park standing at a height of 6 metres. Adorned in his military uniform and royal hat, visitors can almost visualise how powerful the emperor must have been back in the olden days. 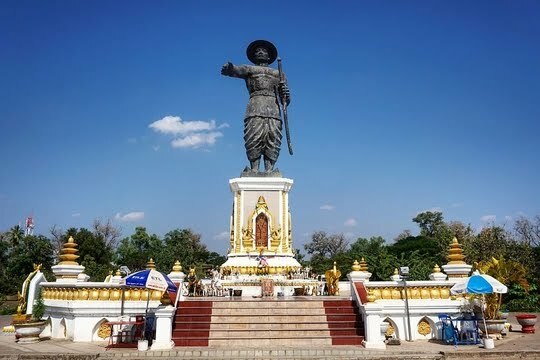 Interestingly, the statue glances across the Mekong in the direction of Thailand (Siam) and holds a sword in one hand while offering a handshake in the other that has been explained to be a greeting to the Siamese. In my opinion, it is almost reminiscent of his efforts to fight against Siam’s suzerainty where he exhausted both options of peaceful diplomacy and physical rebellion to try to regain sovereignty for Vientiane. 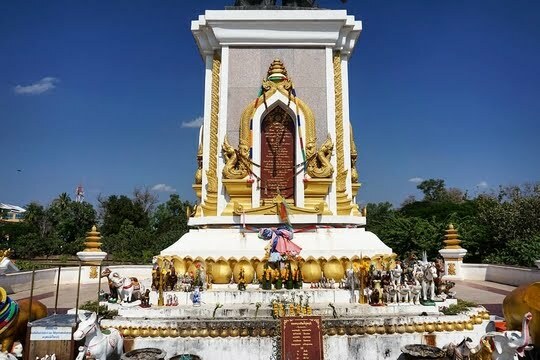 Widely revered as a courageous hero who fought to his death, the King’s statue has an altar where locals visit to make their offerings and do their prayers as a sign of respect as well. The number of offerings at the altar under the king's statue prove his popularity with his people! 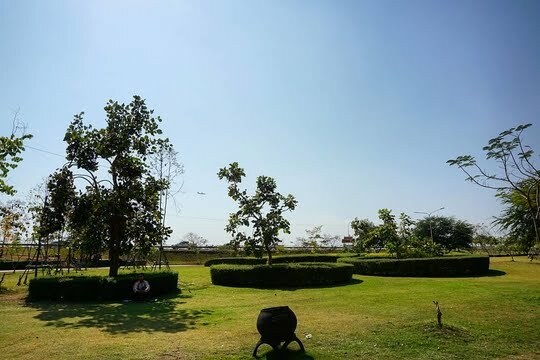 Definitely more of a local hangout than a tourist attraction, Chao Anouvong Park attracts quite a number of locals who practise their tai-chi here in the morning and even enjoy a picnic or just take a nap in the shade of the trees in the afternoon. The signboards are even designed to be consistent with the architecture of temples here. Visitors can also grab a huge, chilled bottle of Beer Lao for 5,000 LAK (USD 0.60) from one of the few stalls in the park and enjoy the occasional breezes or bask in the sun here. Sit back and relax or simply stroll along the green fields in the park! However, the park is certainly not one of those beautiful, well-kept ones we see in other parts of the world. 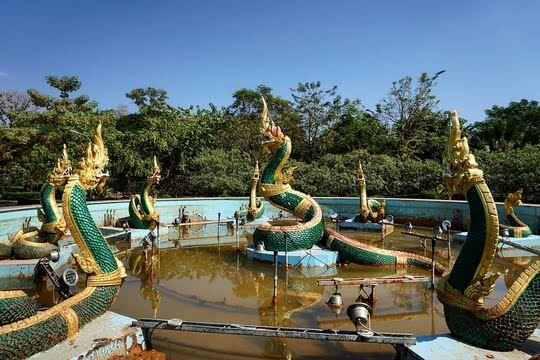 Visitors will stumble upon a tiled fountain adorned with numerous dragon structures gilded in gold when walking back from the statue of Chao Anouvong. The metal pipes are rusty, the water is dirty and the entire fountain is no longer functioning – let’s just say that it has probably seen better days! The inability to sustain these fancy installations in this park which was only constructed less than a decade ago brings us back to reality and sheds light on the true economic situation of the country. With a nominal GDP per capita of US$1,709, Laos is currently one of the poorest countries in the Southeast Asian region, only slightly above Myanmar and Cambodia. Nevertheless, having said that, it is certainly heartening to see how tourism is picking up in the country and how various nations are offering their assistance in facilitating Laos’s infrastructural and economic development. 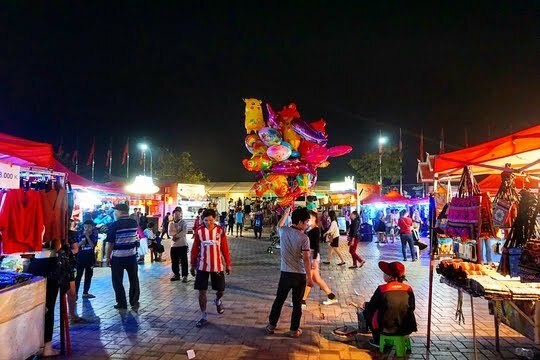 As numerous attractions in this sleepy capital city close rather early, travellers oftentimes find themselves gravitating towards the Mekong riverside to indulge in the vibrant atmosphere of the night market that seems to be the centre of all activity here in Vientiane during the evening. Vendors sweep up wholesale items at the Morning Market and set up their stalls here! 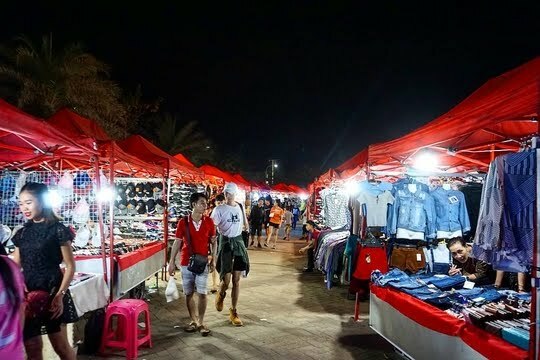 Even though the night market boasting long stretches of stalls pitched under red tentage which seem to go on forever are touted to be aimed at tourists, the merchandise available is far from touristy. There are more stalls at the riverfront promenade so don't forget to check them out too! 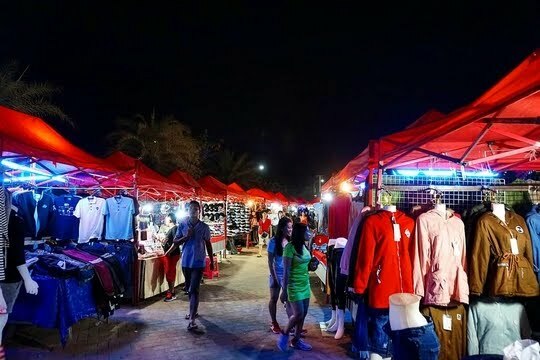 Apart from spotting a few stalls with souvenirs such as keychains and T-shirts, visitors will realise that most stalls are actually selling daily necessities including electronic gadgets, accessories, knockoff goods and especially clothes like the backpackers’ favourite – elephant pants. Beautiful handmade cloth can also be purchased at the Night Market! If you are interested to purchase some of these inexpensive goods, be assured that most stall-owners are able to converse in basic English so language barriers should be minimal. If all else fails, you can always rely on the dependable hand signs (like I did)! Nevertheless, be prepared to put your bargaining skills to good use as initial prices suggested by the vendors are almost always very much inflated. As with many other night markets in Southeast Asia, the same items are oftentimes vended by numerous stalls, so it pays to walk around to get the best bargains. There are probably a hundred stalls selling clothes, another hundred selling electronics ... yeah, you get my point! 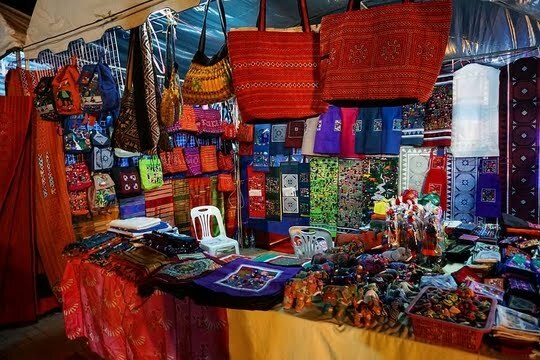 For tourists who are interested to purchase mementos, the Vientiane Night Market may not be that suitable a place to do your shopping. Nevertheless, do not fret – you will be pleased to know that you will be able to pick up plenty of souvenirs from the night markets in Vang Vieng and Luang Prabang, which are primarily catered to tourists and offer myriad items that you may like to bring home for family and friends – from your typical souvenirs like magnets and postcards to local produce and even handmade accessories made from bombs dropped in the villages. 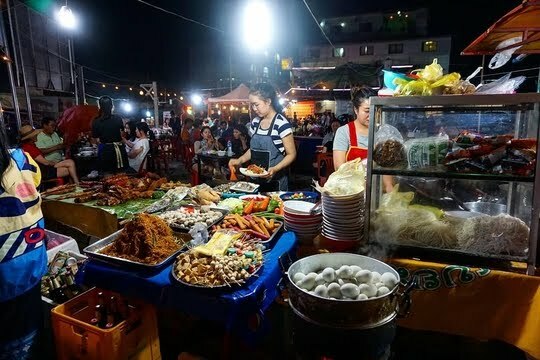 Even if you are not interested in purchasing the fake Adidas or Nikes here, the night market certainly offers a great opportunity to observe the Lao way of life reminiscent of communal life where the vendors seem to know one another very well and chatter away gleefully. 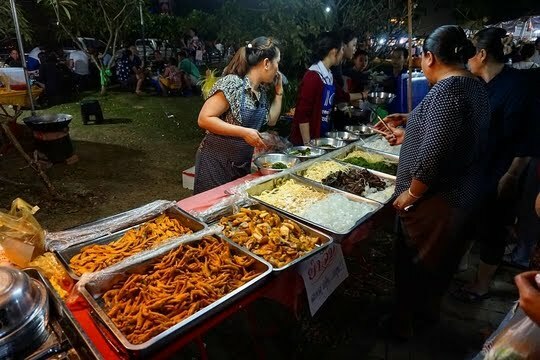 Even though food stalls in the night market are few and far between with an occasional dessert or drink stall, travellers can satiate their appetites by walking along Quai Fa Ngum where numerous makeshift food vendors have set up their stalls selling a wide range of local fare. These grilled pork sausages glisten under the light and smell fantastic! 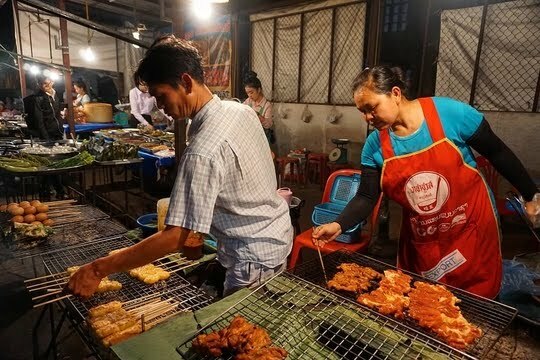 Alternatively, visitors can also walk to the end of the night market where there are sin dad (similar to mookata in Thailand) stalls. Locals and tourists alike enjoying their dinner at this roadside haunt. Here, customers will have the opportunity to choose the ingredients they would like to grill on a hotplate or cook in a steamboat. This essentially feels like a buffet... for really low prices! 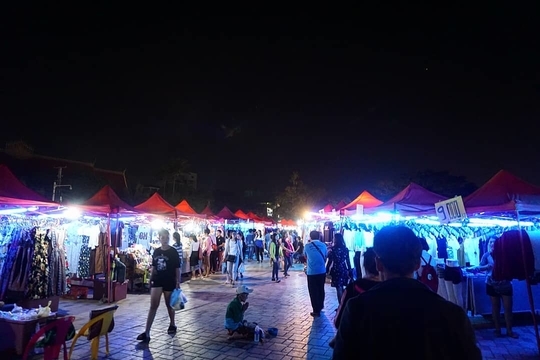 However, I would recommend that travellers venture further out to Vangthong Evening Market which is much less touristy than the area along the riverfront promenade. You'll smell the aroma of the food before you even see the market! 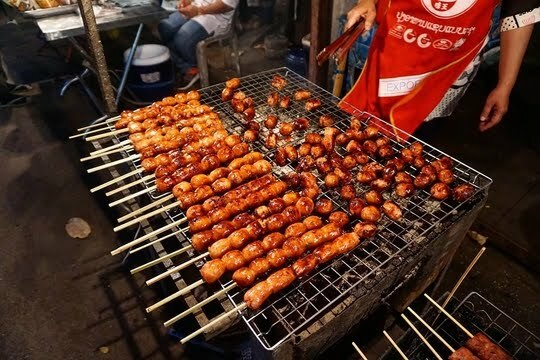 A hidden gem yet to be uncovered by most travellers, the Vangthong Evening Market offers a wide variety of local delicacies such as main courses including rice with sides but focuses primarily on the local favourite – grilled items served on skewers like the famous ping gai (grilled chicken). Fried chicken cutlet and Lao sticky rice sealed the deal for me! 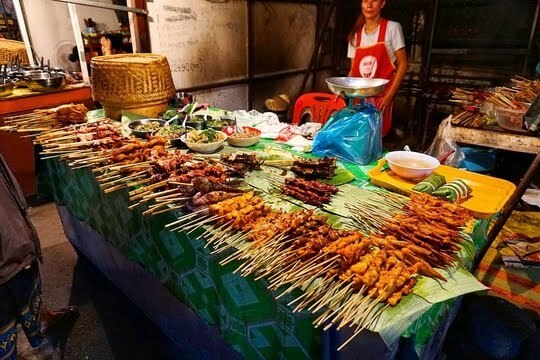 Strolling from one end of the market to the other, tourists will be able to pick up scrumptious food items at extremely low prices at this market which is highly popular among locals before heading down to the night market and enjoying your skewered delights along the way. This seems to be the locals' favourite - sticky rice with a choice of sides! Whilst strolling along the Vientiane Night Market and traversing the riverbanks of the mighty Mekong, travellers and locals alike are treated to the gentle breezes and will be able to admire the brightly lit skyline in Thailand on the other side of the river. Sitting along the river bank with a Beer Lao in tow seems to be one of the favourite pastimes of the locals and certainly makes for a romantic getaway from the hustle and bustle of the night market. Looking for fun? Play with locals and travellers at this 'wet' playground! 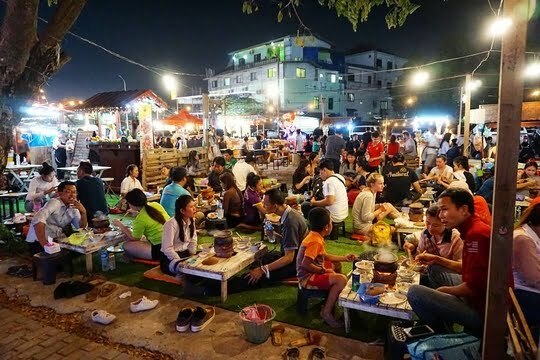 During my trip to Vientiane in January, I was very fortunate to have had the opportunity to experience the Annual Lao Food Festival along the Mekong riverside just behind the Vientiane Night Market where locals set up numerous food stalls with local produce and delicacies for visitors to sample and purchase. 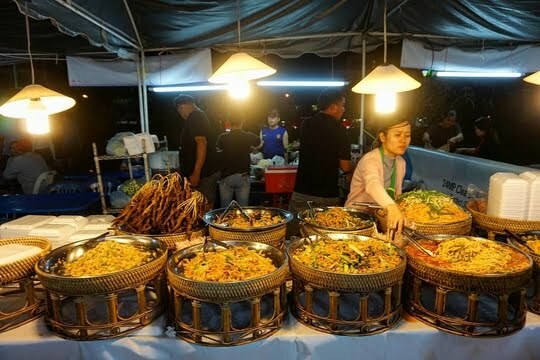 What was even more surprising was that the foreign embassies from regional ASEAN nations such as the Thai and Filipino contingents also took the opportunity to share their national dishes with the Vientiane public. 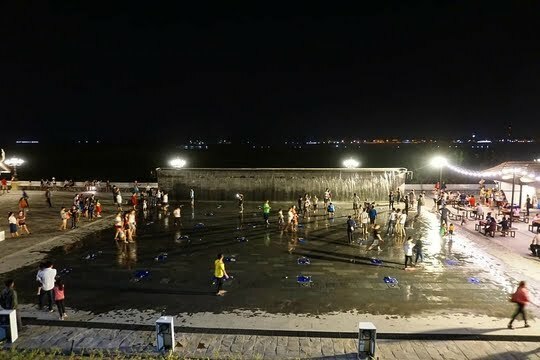 The festival not only offered a wide range of cuisines for travellers to sample but also brought about a whirlwind of festivities and events including a concert and a banquet of sorts, attracting large hordes of locals to the riverside promenade as well. Not sure what these dishes are? Vendors are always excited to let you sample before buying. If you are in Vientiane during the annual food festival, I would highly recommend taking some time to visit to savour affordable local fare, enjoy the amazing ambience of this ‘expo’ and interact with friendly locals along the way. Check out those chicken feet! We eat those at home, but I've heard many are afraid to try them. Now that we are well-versed with the attractions available here in the capital city of Vientiane, let’s check out our next travel destination in this charming country of Laos and escape the hustle and bustle of city life to throw ourselves into the embrace of Mother Nature. Vang Vieng, here we come! Are you inspired to visit Laos after reading this post? If so, please feel free to check out the wide range of accommodation options which have been made available by Booking.com in the link below. You will have the opportunity to choose from stunning vacation homes and luxury resorts to apartments and amazing B&Bs where you will be hosted by local families - to make your holiday the most amazing one you've ever had! Booking.com has made it easy to book accommodations in all travel destinations including here in Vientiane, so do head over for great deals! I can't believe how many temples there are! Great information that will come in handy when I make it there in the not so distant future. 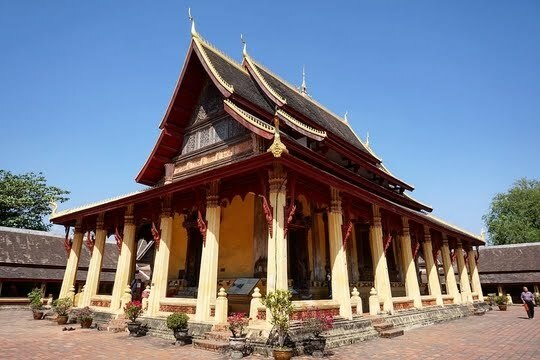 Hey there, Vientiane is certainly home to innumerable temples as the country is primarily pivoted around its staunch belief in Buddhism since ancient times. Not only will visitors be able to admire the magnificent architecture and skilfully carved designs on the exterior of the temples, they will have the golden opportunity to interact with amicable devotees and friendly monks who are willing to share more about their local culture and traditions. Glad to hear that you have found the information I've shared in this post useful. 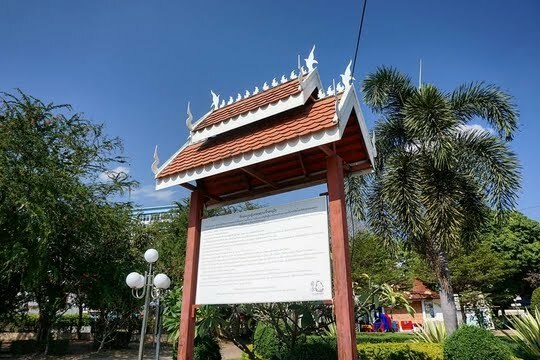 Prior to my trip, I actually attempted to research from online sources but some of the information provided was inaccurate or outdated, so I certainly hope that sharing these details and tips I have gathered during my travels in Vientiane here will be able to benefit travellers who intend to visit the area in their planning. Hope you'll be able to visit soon as well! I’m in awe at the intricacies and beauty of all the wats in Laos. It’s incredible to think that many of these structures were made entirely by hand long before electric tools and JCB etc were around. And you’re totally right, the presidential palace could definitely pass as being in europe! Hi Rhiannon, it is definitely mind-blowing to attempt to fathom how the people used to construct these magnificent structures back in the past when technology is not as advanced. I guess that is essentially the appeal that these ancient relics have that continue to attract travellers all over the world - be it Angkor in Cambodia or even the Great Pyramids of Giza. 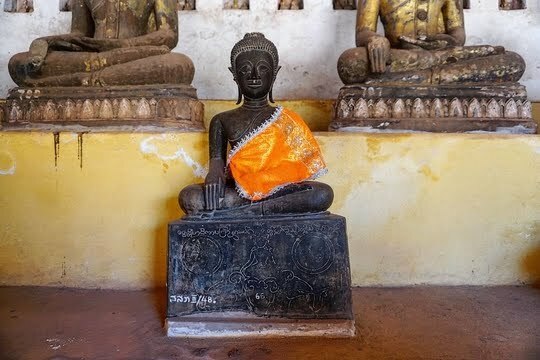 Wat Si Saket is certainly a wonder here in Vientiane, as it is the oldest Buddhist monastery in the entire country, so travellers should definitely consider visiting this temple when in the area. Like many of the other wats in the capital, it boasts beautiful architecture, rich culture in the form of its ancient relics and artefacts as well as the opportunity to better appreciate local traditions and practices. Quite the contrast with the Western Presidential Palace, considering they are just on opposite sides of the road! More places that I haven't visited in Vientiane! Reading your posts make me want to plan an encore trip, Nathan. I have visited the night market and the evening market though. The Night market seems to have got an upgrade in recent years, with at least a few permanent structures. Relaxing with a Beer Lao in hand was one of my favorite ways to spend an evening as well when in Laos! Hi Denny, great to hear that you're inspired to revisit Vientiane as there is so much that this capital city has to offer which is oftentimes neglected by travellers in the region. I personally have missed some of the sights in Vang Vieng and Luang Prabang when I was in those cities, so I would very much like to return to Laos in the near future to be able to experience those missed attractions as well. Certainly, grabbing a huge bottle of Beer Lao for an inexpensive USD 0.80 and waltzing down the Vientiane Night Market is certainly the way to go to unwind and immerse oneself in the vibrant atmosphere just emanating all over the market. 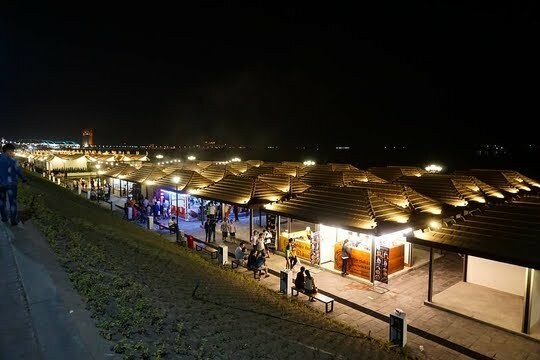 The promenade was a nice, urban addition to the Chao Anouvong Park area which offers locals and tourists alike a common area to just relax and enjoy the views of the mighty Mekong while feasting on some of the foods being vended at those stalls. Be sure to check that out when you're back in Laos! The Western circuit of Vientiane seems as fascinating if not more than the Eastern Circuit. The simple architecture and the survival story of Wat Si Saket had me riveted to the post. The statues of Buddha add an intriguing aura to the place. The other structure that really amazed me was the presidential palace which looks so immaculate.Looking at the pictures I was strangely reminded of the White House and also some other Palaces of European countries. Hi there, glad that you enjoyed this little tour that I had put up for these attractions which are essentially just a stone's throw apart from each other, potentially offering a relaxing itinerary to just unwind and live like a local. 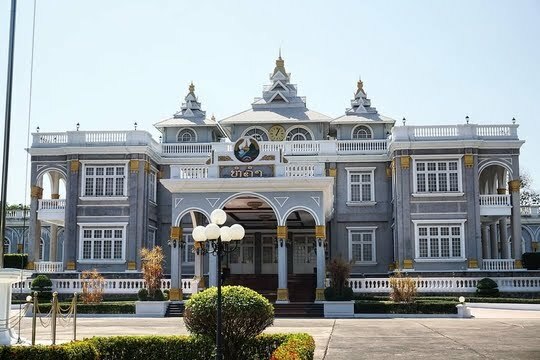 I've not been to Europe yet, but this Presidential Palace here in Vientiane certainly gave me a pretty good impression of the majestic structure to expect when I visit Europe next year - so excited for that! Wat Si Saket certainly proved to be resilient to have been able to survive the Siamese invasion which had caused massive destruction throughout the entire city and ravaged numerous wats including all of those covered in the Eastern Circuit. The thousands of Buddha images and statues throughout the entire temple certainly accentuate its beauty and reverence that the locals accord this magnificent place of worship with. We loved Wat Si Saket! The walls full of tiny Buddhas made it one of the most memorable wats we visited during our 2.5 months in Southeast Asia a couple of years ago--such a unique look! 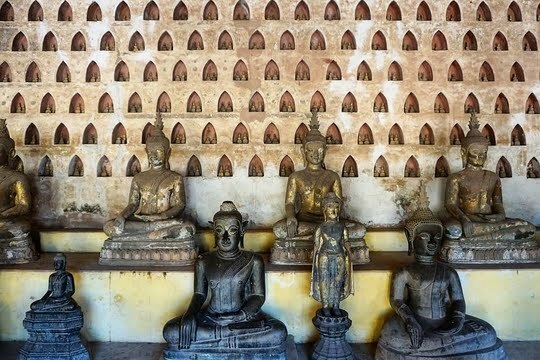 Vientiane is a very cool city--we only spent one day there, but we'd love to give it at least 2 next time--we still need to go visit Buddha Park! 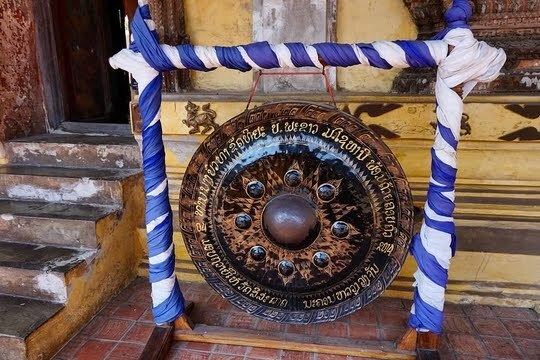 Hi Kate, it's certainly great to know that you enjoyed visiting Wat Si Saket during your short visit to Vientiane! The cloister walls with thousands of niches containing miniature Buddha images were certainly one of the highlights in the temple, as they were so intricately designed and immaculately packed together in pairs. Combined with the opportunity to observe locals worshipping and making offerings to these statues, this temple was certainly one of my favourites during my trip around Laos as well. 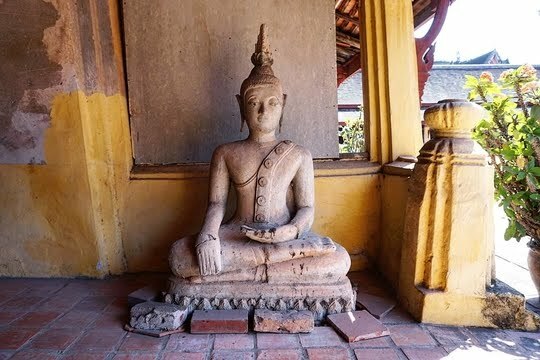 The rich history behind Wat Si Saket is so interesting. And had I just seen a photo of the Presidential Palace without any explanation, I never would've guessed that to be located in Laos. I've only been once to Luang Prabang (which I really enjoyed) but would love to go back and explore more of Laos, including Vientiane. My sentiments exactly, Diana! The Presidential Palace ironically looks so out of place from the rest of Vientiane - understandably so, as it was intended to house the royalty back in the day. It certainly looks very much French-influenced with its unique Beaux art style with just a little tinge of traditional Lao design with those stupa structures just at the tip of the building. 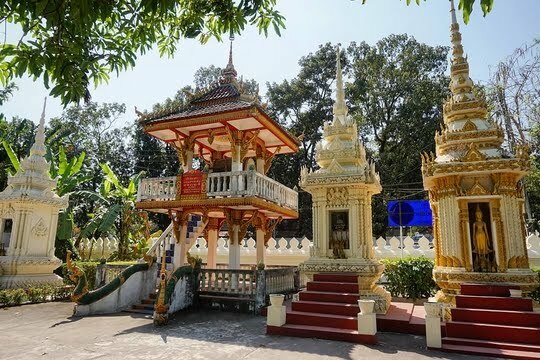 Luang Prabang is certainly an amazing travel destination brimming with rich culture and heritage (with its numerous temples), beautiful natural scenery all over (near the Mekong) and makes for awesome day trips to Kuang Si Falls and Pak Ou Caves. You should definitely visit other regions of Laos which are equally, if not more, beautiful as Luang Prabang. Vientiane is certainly a good starting point to learn more about the country's traumatic history and local traditions, while Vang Vieng is definitely not to be missed with a wide array of outdoor activities as well as one of the most beautiful natural landscapes I have ever seen. Stay tuned as we explore these regions in subsequent posts as well! We just came back from Laos and a bit bummed didn't do to Vientiane. Wat Si Saket looks so nice, love the inside. Presidential palace looks the best! A great mix of modern and Laos culture! Hey Mimi and Mitch, great to hear that you managed to visit Laos which is terribly underrated and oftentimes neglected by travellers in the region. No worries about not having visited Vientiane, as it is these little things that make us want to revisit places and explore more of the sights and sounds they have to offer! 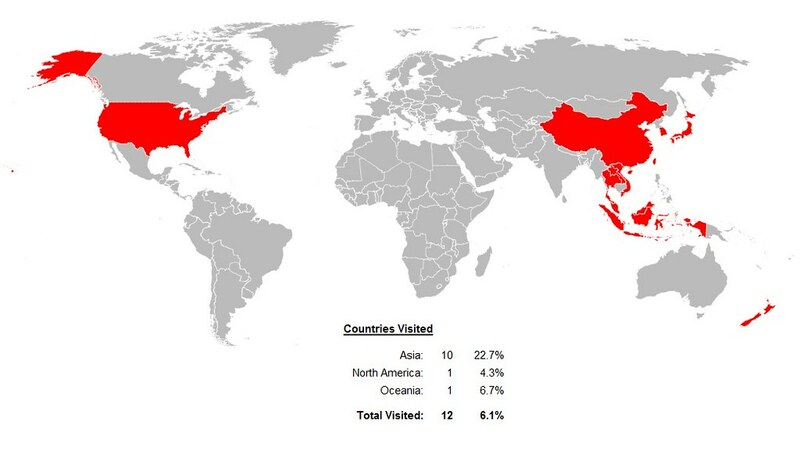 I'm guessing that you visited Vang Vieng and Luang Prabang to the north of the capital city. Being the oldest Buddhist monastery in the entire country, Wat Si Saket is certainly one of the most intriguing temples in Laos. The thousands of Buddha images and statues being placed in miniature niches in the cloister walls certainly accentuate its beauty and adds to that local flavour unique to the temple. Certainly hope that you will be able to visit this part of the country that is not often visited and I'm sure you'll have a great time! Hey Priya, having been under Siamese suzerainty and rule as well as French colonial rule for a prolonged period of time, Laos is essentially at the cultural crossroads with influences from both the East and West which culminates in unique monuments and artefacts such as the Patuxai Victory Monument as well as the Presidential Palace both displaying French-inspired architecture with a unique local twist and flavour to their designs. Laos not only has a rich culture and heritage as well as amicable locals who are willing to lend a helping hand, but also offers one of the most authentic travel experiences where sights remain raw and untouched - very much contrasting with the prepackaged, commercialised travel industries in many of the developed countries. 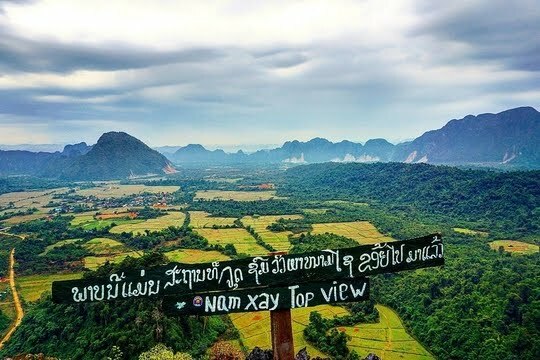 Being one of the most underrated travel destinations in the region also means that attractions in Laos are not that crowded with tourists and you will probably have the opportunity to get places to yourself as well. The Wat Si Saket looks so interesting. 10000 Buddha statutes!The Vientiane Night market looks the perfect place to unwind and collect souvenirs. There is so much intriguing heritage and culture in these places. Thanks for the wonderful post. Hey there, Wat Si Saket certainly proved to be resilient to have been able to survive the Siamese invasion which had caused massive destruction throughout the entire city and ravaged numerous wats including all of those covered in the Eastern Circuit. The thousands of Buddha images and statues throughout the entire temple certainly accentuate its beauty and reverence that the locals accord this magnificent place of worship with. 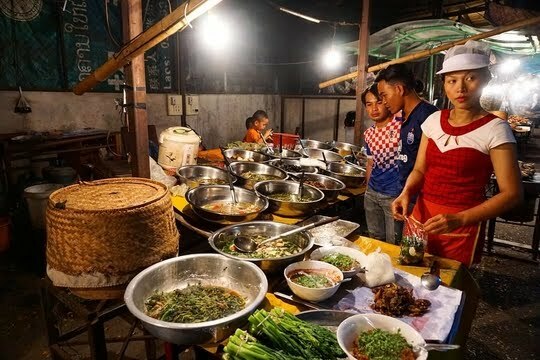 The Vientiane Night Market is certainly a great way to learn more about the livelihood and culture of the locals by observing how they interact with one another amicably. It almost feels like a large village where everyone knows one another in a very communal, primitive setting. Grab a Beer Lao for just USD 0.80, walk around the shops, enjoy the breezes along the Mekong and you are set for an amazing evening! 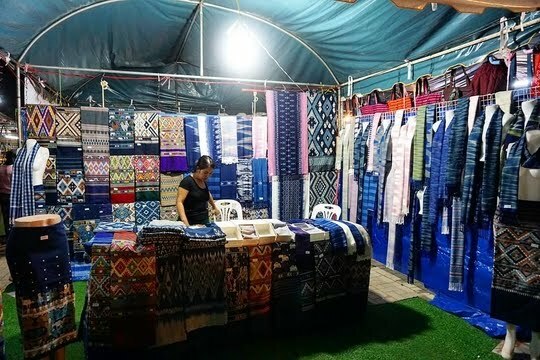 Nevertheless, as mentioned, the night market may not have that many souvenirs, so you may wish to consider heading to one of the night markets in Vang Vieng and Luang Prabang to do your shopping instead (if you are heading to these popular destinations). I would love to visit Wat Si Saket as it has 10,000 Buddha statues. 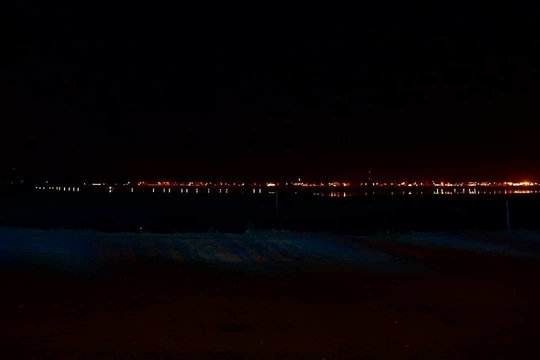 It looks very unique and spending time here would really peaceful and relaxing. Presidential Palace looks majestic and grand. Lovely and detailed guide of Vientiane. Hi Yukti, thank you for the lovely comment.The cloister walls with thousands of niches containing miniature Buddha images were certainly one of the highlights in the temple, as they were so intricately designed and immaculately packed together in pairs. Combined with the amazing history of being able to escape from the devastating Siamese invasion unscathed unlike many of its counterparts, this temple was certainly one of my favourites during my trip around Laos. 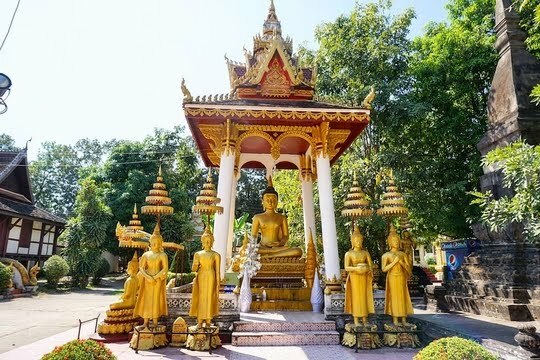 These temples certainly offer travellers with the unique opportunity to observe locals worshipping and making offerings to these statues as well as to interact with the friendly devotees and monks who are always willing to share more about their local practices and traditions with foreigners. 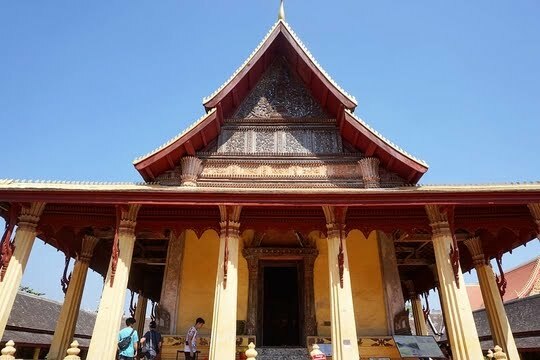 You should definitely consider visiting some of these wats in Vientiane when you're in the area - Wat Si Saket isn't a bad place to start! That’s what people have told me that Laos has a very slow pace and helps you slow down. The architecture of Wat Si Saket is so intriguing! There is a certain mystery to the restored old statutes of Buddha. Golden Buddha statues look beautiful! Presedential palace is grand. I like exploring such buildings! Hey Abhinav, Laos is probably one of the quietest capital cities in the entire of Southeast Asia (I'm not including Naypyidaw here as it is often deemed as a ghost town more than anything). The locals are very easygoing and everything seems to be moving at a slower pace - travellers to this country may not be well acclimatised at first with restaurants taking a long time to serve their dishes (especially in Vang Vieng) and buses taking longer than advertised to arrive at destinations in other regions of the country. Once you slow down your footsteps and observe the little details of the local way of life, you will then be able to truly experience Laos. 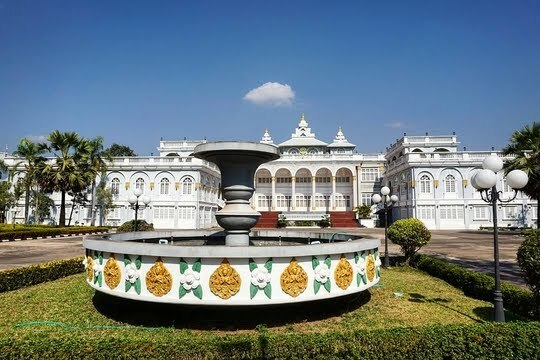 The Presidential Palace is certainly a majestic architectural artwork which cleverly infuses French-inspired Beaux arts style with a unique Lao twist in the form of those intricate stupa structures adorning the roof of the building. 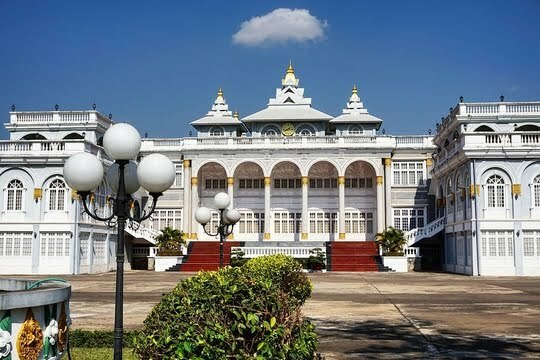 It's sad to think about how the royalist Lao government constructed this palace but never managed to reside in it, having been overthrown by the communist Pathet Lao soon after, though. Sounds like many places in my country India. I would love to explore Laos. This post reminded me of my time in Laos. I loved spending time at Wat Si Saket and Presidential palace. Laos has a certain understated charm to it, which stays forever with you. Hi Archana, I guess that essentially sums up the entire experience in Laos for me as well. It just has that untouched beauty where sights are being retained in their primitive state instead of being prepackaged - essentially, it's just like someone without makeup. It is certainly one of the most authentic travel experience I had ever felt during my myriad trips, as the entire package did not come across as commercialised but rather very 'raw'. It's certainly sad that this country is terribly underrated and oftentimes neglected by travellers who are visiting the Southeast Asian region in the likes of neighbouring Thailand, Vietnam and even Cambodia. 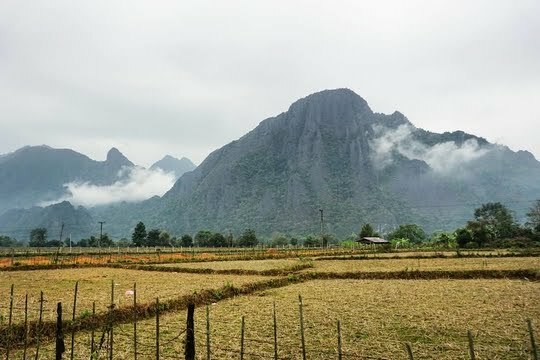 Nevertheless, tourists are beginning to realise this unique charm that Laos has and are starting to include this country in the itineraries for the banana pancake trail as well, so it's getting the attention it very much deserves. Glad to hear that you enjoyed your trip to Laos - I certainly had a great time there as well! Laos is one country which I wish to travel very soon. Many of my friends had visited Laos and had great experiences. This post was very infomrmative. I would visit the Budhist temple and the night market for sure. Thanks for sharing. Oh what a fun trip! I grew up with kids from Laos and I've always been interested in visiting someday. We've been to Thailand and it looks like these night markets are just as cool! I still can't get over the thousands of Buddha statues. How awesome! Reading this is definitely making me want to visit Laos sooner than later! Those Buddha statues are amazing, and I think I would take over 100 photos! The night market looks vibrant and the food delicious too I bet! A lovely post. I have been meaning to visit Laos for quite some time now, and reading this post just put it up on my priority. 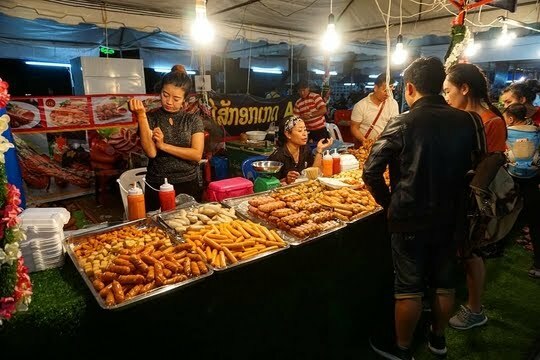 What I love the most about theses south East Asian cities is the vibrant night markets, where there is a lot of dirt cheap shopping and a ton of yummy food, which always brings out the foodie within me. Vientiane is so pretty! I liked reading about the history of Wat Si Saket and why it wasn't destroyed. All those excavated Buddhas together are a very impressive sight. The Beaux Arts palace really does look like it belongs in Europe! I've seen some government buildings in San Juan, Puerto Rico that look like that too-it's quite colonial. I was funreading your posr about Vientiane because it brought back all good memories of our trip to Vientiane in 2011. You did really a great job describing all these places and the atmosphere. I am not sure if we missed the night market on 2011 or it was simply not yet there? The "wet playground" was not there either! Nevertheless, coming origin from Bangkok I totally adore Vientiane because its small and very cosy! I love the history behind Wat Si Saket. I've not yet been to Luang Prabang so really want to see this place for myself one day! Laos looks amazing! haha I did not find Vientiane to be all that relaxing, honestly. It looks like you got to explore more of the city than I did, though. Glad you enjoyed it! Great post! It's fascinating to see all of the temples and how cared for they are in comparison to the parks and everything. It looks like a really great place to visit. Thanks for the itinerary. A century old Buddhist temple with more than 10000 images!! Wow!! That interests me. And so does the french architecture inspired presidential palace. And the street food market looks delicious too. This is a really great itinerary! I appreciate the details and of course all the beautiful pics! I think top my list though would be the Night Market followed by Wat Si Saket! This is a good Itinerary. I liked the fact that you have included everything. I am really impressed by the Presidential Palace for its stunning architecture. The night markets are the great place to know more about the local culture, specially food. I simply love sampling local food and I can already see a lot mouthwatering street food. Loved the post. Wow! It is a great information. So many Buddha's statues...incredibly beautiful. You have given great detailed info about local night markets. The food looks really awesome and I am sure it was lip smacking. Lot of variety for food lovers and explorers. 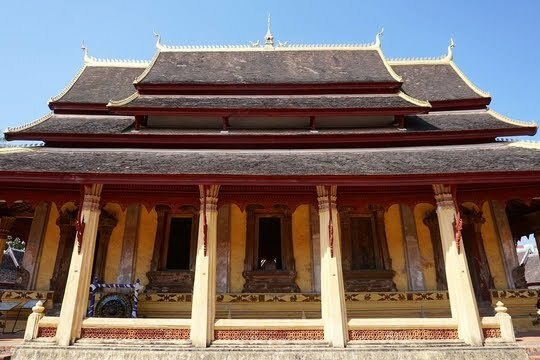 We would love to visit Laos someday and see some of the great sites in Vientiane. I really like Wat Si Saket and could spend a great deal of time soaking in the architecture and history of the wat,. The Presidential Palace also looks like an interesting place to visit. I also love the look of the park and could spend a lot of time strolling through the park or taking a nice rest.